At the end of the fifties, the Rootes Group was doing very well and the Sunbeam marque was enjoying a lot of success in European rallies thanks to the Rapier and great drivers like Harper, Jopp and Hopkirk. In 1959 the Sunbeam Alpine was launched allowing Rootes to enter the sports car market and compete with Abingdon's MGA and Triumph's TR2 but with new standards of comfort. At the top of the range, the new Humber Super Snipe had been out just a year offering a larger engine than the existing Hawk and, at the lower end of the range, the Hillman Minx and Husky continued to sell well. Singer, recently acquired by Rootes, was represented by the Gazelle, a luxury medium sized family car in the Minx mould. In short, the Rootes Group was confident in the future and William Rootes became Lord Rootes.Rootes were always masters of the art of badge engineering and very few engines were used in these models. A four cylinder 1494cc unit powered the light car range of Minx, Gazelle, Rapier and Alpine with only minor variations in specification to produce different power outputs. 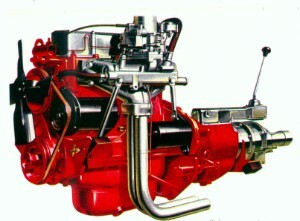 This engine was soon to be enlarged to 1592cc although a smaller 1360cc version continued to be used in the Husky.The Humber Hawk was powered by a 2267cc four cylinder engine derived from the Sunbeam 90 power plant and the Super Snipe by a six cylinder engine based on an Armstrong Siddeley design enlarged to 2651 cc but later stretched to 2965cc. Looking to the future, work had been progressing since 1956 on a small car, still code-named 'Slug', which eventually saw the light of day in the Spring of '63 as the Hillman Imp. Another new model range, although not so radical, was in the pipe-line; the Hillman Super Minx, Singer Vogue and new Sunbeam Rapier were ready for introduction during the sixties and would at first use the 1592cc engine. However, the existing Rapier continued to sell so well that the new model appeared alongside it as a small Humber, the Sceptre. The Sunbeam Alpine was unveiled before the world's press in July '59 at Cannes in the South of France. The engineer who was to supervise all future developments of the model was Alec Caine. In order to improve the Alpine, one of his desires was to increase the driver's limited leg-room but the Rootes design department was not convinced that a problem existed and Alec Caine decided to continue his research independently. As Rootes representative he was to attend the Turin salon of October 1959 and while in Italy showed an Alpine to the coachbuilders Touring of Milan. Touring were able to lower the pedals an inch or so and back in England this modification was adopted on the Series II Alpine introduced in October 1960. At the end of 1960, it became apparent that Touring were often involved in modifying Alpines for customers of the local Rootes agent in Milan and the Rootes design department was particularly interested in the way Touring had increased the Alpine's limited boot capacity. Alec Caine was sent back to Italy with an Alpine so that Touring could modify it and the result was a boot with the spare wheel mounted forward against the rear of the passenger space and the large floor mounted fuel tank replaced by two smaller tanks, one in each wing. Touring hadn't stopped there though, they had also chopped the rear wings, fitted a wooden dashboard and a wood rimmed steering wheel! Alec returned to Coventry with the modified Alpine and the design department agreed to work on the design, trying to improve all Touring's modifications, such as the fuel filler arrangements for the twin tanks which were very primitive. The result was that the Series III Alpine offered a much larger boot yet with increased fuel capacity and a Grand Touring model would be introduced with a wooden dashboard and wood rimmed steering wheel. The new wing shape however would be held back until the Series IV was ready In 1964. 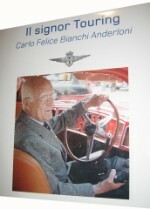 Carlo Felice Bianchi Anderloni took over from his father as head of Carrozzeria Touring in 1948. During the fifties the factory was very successful thanks to excellent work on projects for Bristol, Pegaso, Alfa Romeo, Ferrari and Aston Martin's DB4. All these cars were built by the Superleggera method which involved building a tubular steel framework on the manufacturer's chassis and then attaching aluminium body panels not, however, directly in contact with the steel to avoid electrolytic corrosion. Touring's order book grew rapidly and the decision was made to switch from cottage industry to full scale industrial production methods. A new factory was built at Nova Milanese, one of Milan's northern suburbs and it had to be large enough to cope with orders resulting from agreements with Lancia for the Flaminia and Alfa Romeo for the Spyder 2600 as well as further work for Lamborghini and Maserati. Touring also entered into an agreement with Rootes management on 23rd October 1961 for the assembly in the new factory of a maximum of four Alpines and ten Super Minxes a day to supply the Italian Market. This agreement was to remain in force until the demise of the Touring company. At last, in 1962, the new factory opened for work; even boasting an assembly line, which had meant the difficult re-training of the company's assembly workers over the previous months. Nevertheless, in true Touring style born of decades of tradition, each and every customer could still have his car built to his own personal specification. Touring's work-force could still achieve almost anything! 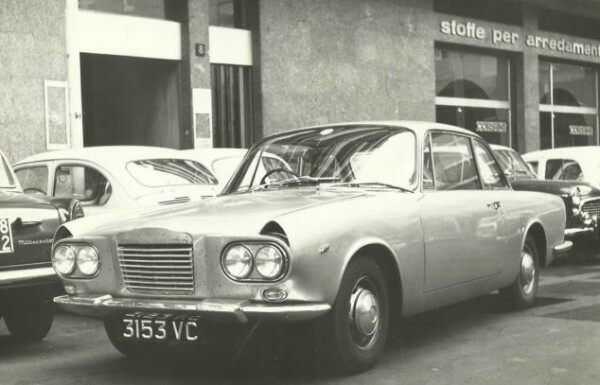 Rootes' Italian subsidiary was also in Milan and was managed from 1960 to 1965 by George Carless who had the idea of producing a smart sporting saloon specifically aimed at the Italian market. In the spring of 1960 George Carless presented his proposal to Brian Rootes who was full of enthusiasm for the project. The staff at Ryton were more hesitant; in the sixties no self-respecting British engineer believed that foreigners could manufacture a better car than they could! George Carless went ahead and talked to Touring around the end of the year in the knowledge that the company was involved in the Alpine modifications and that Rootes, through Alec Caine, already had contacts there. Sr Anderloni was receptive to the idea as it would make good use of the new factory being built at Nova Milanese. The agreement to assemble Alpines and Super Minxes was still undreamt of. Naturally Alec Caine was to be the engineer responsible for liaison between the companies. In 1961, Touring began the design work for the new car and built a 1:10 scale model. The styling was similar to other current Touring models, in particular the Lancia Flaminia and Maserati. They all have similar rear wings, wrap-around windscreens and clean lines. Primarily it is the front which characterizes each car; the Venezia having twin headlamps with apertures above and vertical bars to the radiator grille. The rear wings were shortly to be seen on the Alpine, the fins of the earlier series being trimmed back. Thus the Touring style was immediately recognizable. Unlike Bertone or Pininfarina, all Touring's designs were a team effort, with Sr Anderloni's father personally supervising the styling co-ordination. The principal draughtsmen on the Venezia were Frederico Formenti and Aquilino Gilardi, who was mainly responsible for the full scale drawings. At about this time the name "Venezia" was chosen by George Carless. Towards the end of 1961 the 1:10 scale model was shown to Lord Rootes and his colleagues, who were sufficiently impressed to ask for a prototype to be built. 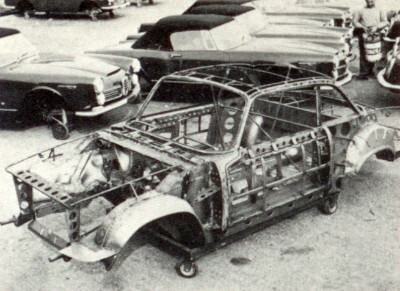 A Hillman Super Minx rolling chassis was sent to Milan where the right hand drive prototype body, very similar to the model, was constructed. A Sunbeam Rapier radiator grille was used, retaining the Sunbeam badge. The apertures above the headlamps first housed indicator lights but were later used for fresh air Intakes, finished initially with small vertical bar grilles. The new dashboard used instruments as fitted to other Rootes cars; however, this received its first modification even before the car went to England. The backs of the front seats were shaped so as to improve leg room for rear seat passengers. As yet, no engine was fitted. In mid 1962 the prototype was taken to England and on seeing it Lord Rootes gave the green light to the Italian coachbuilders. A contract was signed for the initial manufacture of 300 Venezias, to be built on Humber Sceptre chassis and using the Rootes 1592cc engine. (The Sceptre, launched in February 1963, was based on the almost identical Hillman Super Minx chassis.) During the next two months, the prototype was subjected to numerous tests by Rootes engineers, who carried out a few modifications. The fresh air intake grilles were scrapped leaving a single vertical bar, and an engine and transmission were fitted. The prototype then returned to Italy with its (now familiar) English registration 3153 VC. To avoid recognition, its radiator grille was completely disguised. -The petrol filler cap was moved to the side of the right hand rear wing. -The front seats were changed to a more conventional design. -The structure of the doors and their internal mechanisms were revised. painted steel, without a clock and with three scattered warning lights. -The interior lighting was simplified and the sun visors changed. -The soundproofing was examined and improved. warning lights were increased to five in a cluster above the steering column. Thus modified, the prototype was taken once more to England, where it was used for press photographs. For the benefit of the photographs the car was at last given provisional Venezia badges fitted in provisional positions! After its unveiling in Milan on 9th September 1963, the Sunbeam Venezia was officially launched on Thursday 12th September 1963 in the magnificent setting of Venice, and attended by the mayor of the city and the British Ambassador. 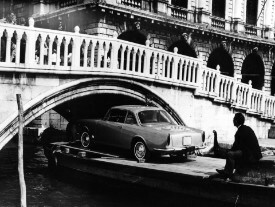 This was the first time that a motor car had entered Saint Mark's Square, the car having been transported there on a gondola along the city's canals. This trip will be long remembered by some people: the handbrake was off and a man leaning on the back of the car started it moving. Fortunately it stopped in time! The press received the car very warmly. However, they were dubious about the price at which the car would be sold by Rootes Italia. Their doubts were not without some foundation. Of the 1963 Rootes models, the Venezia cost about the same as the big Humbers. In 1964 its price was nearly as much as the Sunbeam Tiger with a Ford V8 engine and more than a Jaguar MK2 2.4 litre. How would the Italian, (and at a later date, the foreign) dealers be able to sell a 2+2 design with only a 1600cc engine at such a high price? Of course, they could stress the car's beauty, its comfort, the prestige of owning a foreign car, even its non-rusting aluminium body. But they would have to resort to some cunning as well. Take for example the publicity folder. The quoted 94bhp was inaccurate; the engine was the same as the Humber Sceptre's. The quoted top speed of 175km/h (or 170km/h in another brochure) was also fanciful. The small speed increase over the Sceptre was only due to the weight saving (50kg) from the use of aluminium panels and from a more aerodynamic profile. Another ruse to attract buyers was the fitting of an oil cooler, as supplied on high performance cars. It therefore became apparent from September 1963 that the car would have to be sold in European markets other than Italy, where sales were dominated by Lancia and Alfa Romeo at lower prices. Most European countries were covered, with the exception of Great Britain where high import taxes would have made the retail price prohibitive. Thus, due to the high cost of low volume production the future of the Anglo-Italian Venezia project began to look very uncertain. This reason and others conspired against any further promotional attempts. Firstly, the Rootes Group had suffered several crippling strikes in 1961. 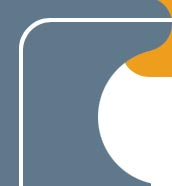 Production programmes were delayed or cut back and financial losses resulted. With the Hillman Imp project already in difficulty Rootes didn't want to risk money in uncertain ventures. The Venezia project assumed a low priority with little likelihood that this would change. 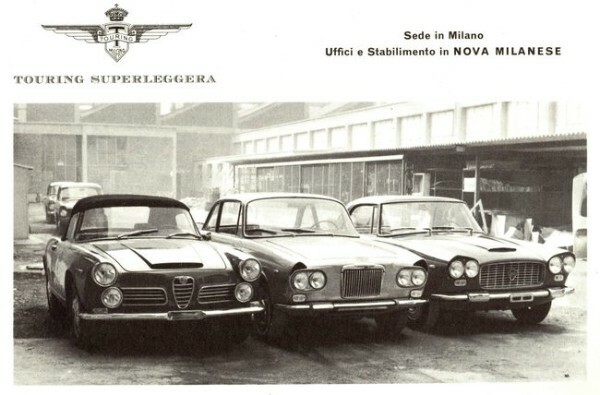 There was also a strike at Touring in 1963, only a few months after they moved to their new factory at Nova Milanese. This was very damaging to the company following heavy investment in the new plant which had left their financial reserves weak. These problems were never to be fully resolved. Lastly, changes in Italian law meant that cars with larger engines were more heavily taxed. Contracts between Touring and Lancia, Maserati and Lamborghini were cut back and design studies for new sporting cars virtually stopped. The Nova Milanese factory was not therefore used to capacity and financial pressures became too great. The company came partly under the control of a receiver in March 1963 with many workers being laid off in 1964. Despite an improved situation the company went into receivership in March 1965, and officially ceased trading on 31st December 1966, although some cars may have been completed as late as 31st January 1967. In the light of these problems the agreement between Rootes and Touring was regularly reviewed with the aim of reducing production quantities. Even in August 1963, Brian Rootes (Export Sales Director), during a visit to Milan, reduced the required number of Venezias to 250. With so many uncertainties clouding its future it became increasingly difficult to sell the Venezia. If the serial numbers are any guide to production quantities little more than 200 units were produced. It is known that Rootes sent only 145 Sceptre chassis to Milan, so it's reasonable to assume that about 50 Venezias were built using floor pans intended for Italian Super Minxes which Touring also built between October 1962 and December 1966. This would have made no difference to the Venezia as the two chassis are identical, but it does imply that Rootes wanted to discourage Venezia production whilst Touring needed to produce as many as possible to reduce the unit cost. 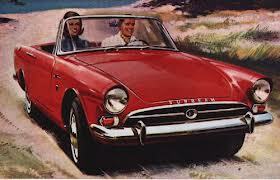 Sunbeam Alpines were also built by Touring from June 1963 until December 1966. Wishing to demonstrate their styling lead, the Italian coachbuilder presented the Alpine with clipped rear wings at the Turin Show in October 1963, pre-empting by some months the launch of the English Series IV with its similar body modifications. But there was to be no such evolution for the Venezia: no all-synchromesh gearbox, no increase in engine power, not even the 1725cc engine which became standard in all Rootes cars by mid 1965, and which was fitted by Touring in the Milan built Alpines and Super Minxes! At the large European shows and in dealers' showrooms the Venezia found itself unable to compete with new models. Handicapped from the start, it appeared progressively more outdated, with its elegant lines the only remaining attraction. A few cars found buyers as late as 1968, but the price had been drastically reduced - as much as 25% between 1963 and 1965. About ten units left Rootes Italia for Spain; they were to be the last. A few attempts were made to save the Venezia. Some people have spoken of ideas to replace the Sunbeam Rapier with the Venezia which from some angles (certainly from the rear), bore a strong family resemblance to the Alpine. Such a scheme might well have succeeded as a more modern appearance would have benefited the now ageing Rapier. 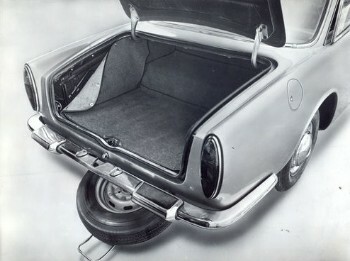 However, financial restraints obliged the Rapier to plod on until 1967 when it received its new fastback body. There was also talk of installing a Ford V8 engine in the Venezia to enable it to compete with other American powered English, Italian and French cars such as Gordon-Keeble, Jensen, Bristol, Iso and Facel-Vega. An agreement was even concluded between Rootes, Ford Motor Company and Carroll Shelby: download. This idea applied to the Alpine had reached fruition in the Tiger V8 with its well known successes and problems. In 1964 Rootes engineers experimented with V8 engines (eventually Chrysler units) in the Humber Super Snipe and Sceptre. Indeed, one Sceptre V8 prototype was built. But Chrysler's financial intervention in the Rootes Group precluded any further experimental development and with Chrysler engines, being larger than comparable Ford units, these projects were soon forgotten. One enigmatic rumour remains: that Brian Rootes owned a Sunbeam Venezia fitted with a Ford V8 power plant. Fact or fiction? Finally, has anyone ever dreamed about a Venezia convertible? Certainly Touring did, and Frederico Formenti even drew up a design study. Even before the Venezia's production run began, circumstances conspired against the existence and development of a beautiful car which had everything going for it. 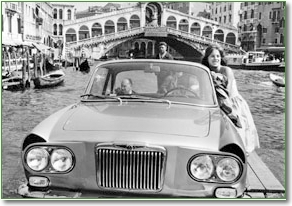 Soon after production ceased, the companies and people concerned with the Venezia's inception were to disappear along with the cars. Touring in December 1966, Rootes in 1969. Carlo Felice Bianchi Anderloni became styling director of Alfa Romeo, Alec Caine was soon to retire and George Carless became managing director of Rootes Motors in the Bahamas. Even the Sunbeam name vanished in 1976 (1978 in some countries). The Venezia: a collectors car? Although original in construction and beautiful in design, the Venezia was largely ignored during the seventies. Like most of the other Rootes cars (with the exception of some other Sunbeams) it was not loved by collectors. But today the status of the Venezia is on a par with that of the other rare post-war Sunbeams such as the Alpine (1953-55), Harrington and Tiger. 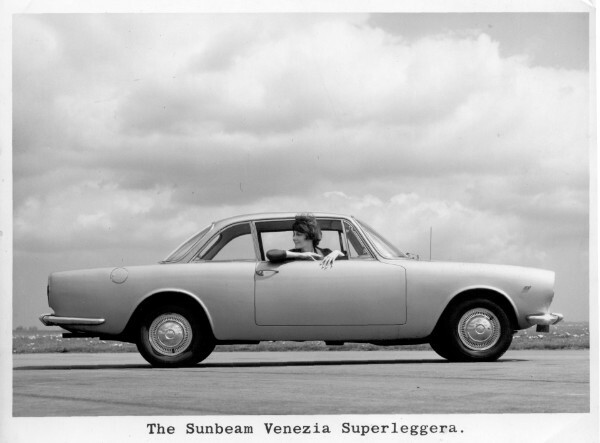 The Sunbeam Venezia will surely now attract the interest it justly deserves from enthusiasts and collectors of English (and Italian!) cars all over the world.